Created by award-winning writers and marketing experts by analyzing tens of thousands of successful campaigns, your template is filled with strategically-crafted example content for each post. Just follow the guidance and swap in your own text, images, and videos—it works! 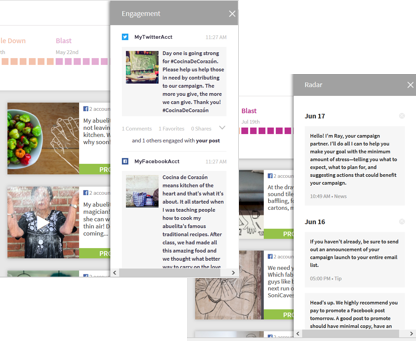 Our social media templates for fundraising and building engagement feature optimized formats and schedules, focused on giving your posts the maximum possible engagement in a crowded social media landscape where most content goes unseen and unappreciated. While every campaign is different, the concept remains the same: stories sell! 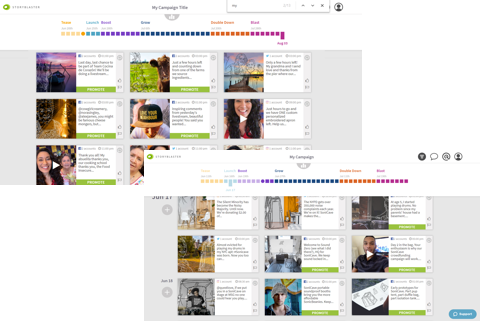 strategically-crafted example content for each post. Just follow the guidance and swap in your own text, images, and videos—it works! Did you know that only 2%-10% of your followers see your posts in their feed? It takes paid promotion to get your content seen—not just by your own network, but also by the right audiences beyond your friends and followers who’ll want to support what you're doing. Storyblaster’s one-click paid promotion gives you agency expertise without the cost of an agency. No upfront fees or percentages taken when you're selling or fundraising, just a small service fee on the dollars you spend. Armed with proprietary data from our partnerships with leading platforms, you can just sit back and watch the new followers and money roll in. Our returns are unparalleled. Did you know that only 2%-10% of your followers see your posts in their feed? It takes paid promotion to get your campaign seen—not just by your own network, but also by the right audiences beyond your friends and followers who’ll want to contribute. Storyblaster’s one-click paid promotion gives you agency expertise without the cost of an agency. No upfront fees or percentages taken from your entire raise, just a small service fee on the dollars you spend. Armed with proprietary data from our partnerships with leading crowdfunding platforms, you can just sit back and watch the money roll in. Our returns are unparalleled. Storyblaster’s alerts give you tactical advice to make the most of your campaign milestones, and tips on what’s trending so you can adjust your posts to tap into the current conversations on social, keeping you on track for success. Reply, comment, retweet, like, all from one window. No more logging in and out of multiple social accounts, pages, and apps.